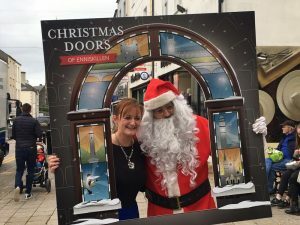 Recipients can spend their Enniskillen gift card in any of outlets that are part of the innovative scheme, proving a successful way to encourage shopping locally within Enniskillen whilst also increasing footfall to the town. Commenting on the launch Enniskillen BID Manager Noelle McAloon said “We’re really excited to launch the first ever Enniskillen Gift Card, it a great way for consumers to enjoy Enniskillen’s unique offering, available to redeem in over 100 outlets. It is an opportunity to boost the Enniskillen economy attracting people to spend locally as well as attracting new customers. Acting as a local currency using the existing Visa infrastructure, it is incredibly easy for businesses to get involved and accept this new form of payment”. If you’re struggling to find the perfect gift for the person who has everything, then the newly launched Enniskillen gift card is the answer! A truly versatile Christmas Gift Idea, the Visa-based Enniskillen gift card has endless possibilities as your gift card amount can be redeemed in over 100 outlets in Enniskillen and you are not restricted to spending in one place! The Enniskillen Card is any fashionista’s dream Christmas gift valid to spend in their choice of independent store or high street favourites or a combination of both! The ‘beauty’ of the Enniskillen gift card is that recipients can treat themselves to a blow-dry, manicure, new perfume or skincare which is accepted in over 100 outlets across Enniskillen! Enniskillen is ‘gifted’ with many talented artists and producers; treat yourself to a hand-made beauty product, craft piece, painting or infamous Belleek Pottery collection. Treat someone special to a short break to Enniskillen with a collection of luxury accommodation to choose recipients will be spoilt for choice of where to redeem their gift card. Thank your customers and staff with an Enniskillen Gift Card this Christmas; accepted in over 100 outlets including it offers your employees and customers the freedom to choose a gift that is meaningful to them. Dolan’s Centra (High Street) and Belmore Court & Motel. Very disappointed that although my card says it expires 11/27 it actually only has 12months on it…learned the hard way. Have another’s one which doesn’t have that exp date on the front. Also stores always say that they can’t check it and you have to let them know what’s on it….yes I know they can go online but that’s time wasted for them so you say I’ll use it again and pay cash!